Our BB has been in our home now for four months and we have never regreted our decision. A great company with great people that produce a superior product. I find the M and H BB to be comparble, if not a little inferior, to a NY Steinway B. You must be talking about that one out of ten new B's that has good sustain, a good set of hammers and a soundboard that is free of ridges (heralding cracks). I saw one like that here in Boston last year. The sound was quite nice, but the non-Renner action was a detraction. Have you ever driven your car on an ordinary road just before getting onto a freshly black-topped, super smooth road? You can have that same experience with pianos. Just play a new NY B and then move over to a new BB. This probably won't work with a new Hamburg B because (I am told) it has a good Renner action. As you can tell, I am not a fan of new NY Steinways. I do, however, love the old ones. I own an old 'O' that I am planning to have rebuilt. In the hands of a top re-builder, these pianos can become jewels. 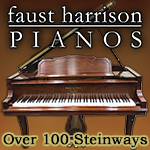 If you go to Faust Harrsion Pianos you can try out both Estonia and M&H in the same place. Correct me if wrong, but I thought all BBs shipped with Renner actions, and the hammers were Renner blues. My understanding is that new Mason BB's and new Hamburg Steinway B's have Renner actions and Renner hammers, but that new NY Steinway B's have NY Steinway actions and hammers. Hamburg Steinway grands use action parts made by Renner,They are not the classic "Schwander"type actions called Renner actions but are of the same design as the New York grand action. These are also balanced(weighed-off) differently than New York models.New York imported alot of their parts from Renner for the model B&D grands years ago when the action manufacturing equipment was on it's last legs and quality was suffering. ...the benefit of which obviously, was not given to their "smaller models" customers. My BB is in my living room ----same size as your space...it is voiced to the room----no problems whatsoever; I play with lid up or lid closed. Something about the feel of the BB versus the A (also an excellent piano) I definately wouldn't worry about the size of the room as long as you have a good tech do your voicing. Thanks for the comments about the M&H BB and room size. I'm going down to Cunningham's tomorrow to play their BB and then back to Faust Harrison on Monday to compare a BB from 1996 that was never sold but refinished by Faust Harrison. It was impressive the first time I played it last week. 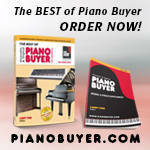 My concern is the depreciation that will take place when that "new" 1996 piano leaves the store. Both stores also carry Estonia but to date, the Estonia has not exhibited the power or sparkle of either Mason model. Sarah Faust, a pianist herself, was more than willing to customize the action on any of their pianos to the customer's request. I was interested in a deeper aftertouch and a "crisper" action on the BB. 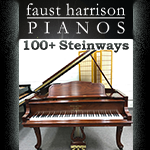 I've played the pianos at Faust Harrison as well, and the BB really impressed me- just as much as a new Steinway B I played elsewhere that same day. Sounds like the power of the M&H has gotten to you! As an Estonia owner, I'll admit that I would have gotten a Mason and Hamlin myself, but my budget was limited to Estonias. Still, I'm having a great time with the Estonia 190 and still am standing 100% behind it. (when I'm not playing ) As a matter of fact, at the NW piano party, it was mentioned that the Estonia sound almost leans to the American group as opposed to the European. The exact comment was it was like a not-grown-up M&H. Anyway, good luck in your search for your piano; you'll know it when you find it! I re-measured my family room and found that it is 13' x 20' not 13' x 16'. I also neglected to mention that there is a 6' x 8' alcove attached to it. After playing the BB today, I think I'll be alright with that piano in that space. Just a note to those who think I can afford the M&H BB: this piano will put me into debt but I'm willing to drive my 11 year old Camry for another 4 years to buy a "final" piano that I absolutely love. I started my piano search planning to spend 20K and thought that the Estonia would be my choice. It still could be my choice although it is not my first choice. My wife still loves the Estonia 190! I do not think you will be dissapointed. 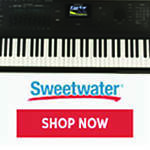 As a pianist, I have played a few differnent BB's, and I have always loved their sound.